This has been in my to-blog list for quite some time. Many of you had asked me to write about this product. So here it goes! I owe a lot to this brand. If not for this “special” brand, my interest in child nutrition wouldn’t have reached this far. When D was around 6 months old, I started her off with plain rice porridge (kanji with no salt or sugar). She spitted and cried for 3 days. I felt helpless and clueless on what to do. A family elder had been after me since D turned 4 months to buy a pack of Cerelac. Though I was strong initially and said No to her, after those 3 days, I succumbed to her wish. I made a small portion of Cerelac and fed D. Guess what, she ate happily and was asking for more. My eyes welled up and the elder member gave me a proud look, “see what I told you!”. I tasted a spoon of it and it tasted EXACTLY like paal payasam (the delicious rice kheer). Thankfully, it didn’t suit my daughter and she had an upset stomach. I stopped it immediately and threw away the pack. That was the turning point in my life (yes, as dramatic as it might sound, that’s the fact). I decided not to pay heed to this elder’s advice anymore and I began to search for homemade weaning food recipes. I had shared some of the recipes in an earlier blog post. Let’s come back to Cerelac. What is it exactly? 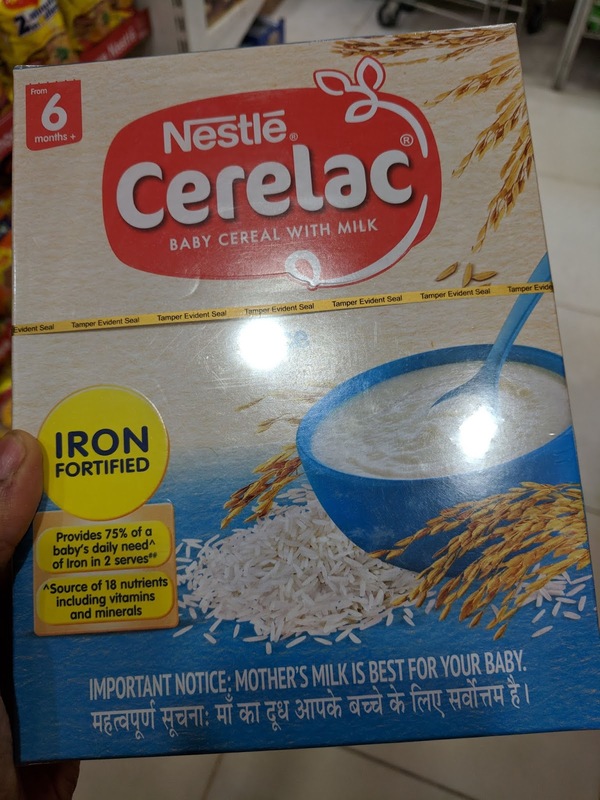 It is an instant cereal food for infants, starting from 6 months. There are different flavours for various growth stages. All one needs to do is buy a pack, take scoops of it and mix it with warm water. 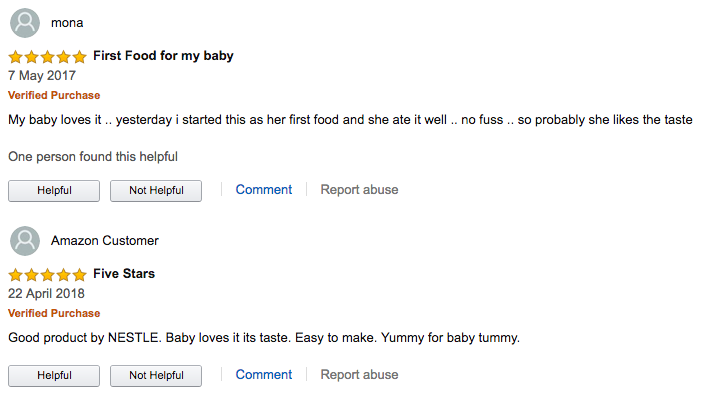 The baby will gobble it up without any fuss. A doctor shared this in FB, “Cerelac is a lazy mother’s dream food”. It is, indeed. Why do babies love Cerelac? Duh, so obvious! SUGAR, SUGAR and MORE SUGAR. WHO guidelines state that babies need to be exclusively breastfed for the first 6 months. Post that, weaning foods can be slowly introduced, but without any SALT OR SUGAR. Cow’s milk can be introduced ONLY after the child completes one year. 1. 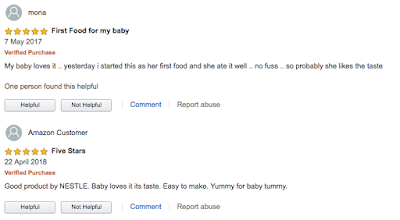 A quick glance at the customer reviews of Cerelac variants in Amazon will show you how babies love it and eat without any fuss. The only reason being HIGH SUGAR. Each serving (25 gm) of Cerelac contains 2.25 gm OR a little more than 1/2 tsp of sugar. If you think 1/2 tsp of sugar is fine, just pause for a moment. 1/2 tsp of sugar might be fine for a 2 year old but what about a 6 month old? The infant is not exposed to sugar until the first spoon of Cerelac is fed. The recommended serving is 2 feeds per day. So the baby is given a tsp of sugar every day. They are forced to get addicted to sugar from such a tender age. As they grow up, they tend to eat a lot more sugary candies and toffees, which affects their immunity. And then we seek out “immunity-boosting” solutions like Pediasure and Immuno-Boosters, which are again loaded with sugar and the vicious cycle continues. 2. An infant cereal has trans-fats, can you believe it? As per the nutrition table, Cerelac contains 0.35gm of trans-fats in 100 gms. 3. When cow’s milk is to be introduced ONLY after the first year, then how could a baby cereal contain “milk solids”? How would the infants be able to digest it? Constipation is such a common issue among infants. Most paediatricians don’t care about these packaged cereal food and they quickly write out a prescription for Dulcolax laxative suppository to address the symptom. 4. 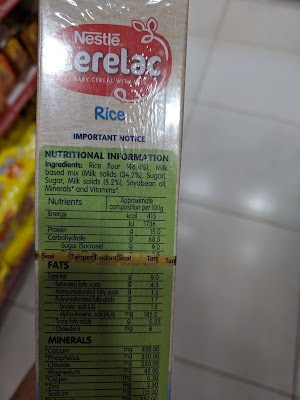 The other variant “Nestle Cerelac Wheat” has 53.8% wheat flour. Is this whole wheat flour or maida? Given that most junk food brands use wheat flour as the name for maida, I’m going with the assumption that this is maida. So the infant is being fed a mix of maida+sugar+milk powder, along with a nutrition promise of “minerals+vitamins”. 300 gms of Cerelac Wheat cost Rs.169. One serving is 25 gm and with 2 servings a day, a 300 gm pack will get over in 6 days. In a month, you will have to buy 4 packs. Do you see how these brands make profits? Do you see where they get such huge marketing budgets for TV ads? Once an infant is started on Cerelac, it is extremely difficult to feed them any fruits and veggies. They become repeat customers till they complete 2 years. After that, the brand hands you yet another cereal box called Ceregrow. These days, I don’t see any TV ads for Cerelac. It has become an “accepted” baby food and every parent buys it by default (OR being forced to buy it because of pressure from previous generation). Cerelac has become a “cash-cow” for the brand and now it has moved on to “capture" other emerging segments like the "growing kids (2-6 years)". I didn’t fall for the trap and now D eats all fruits and most veggies. The weaning stage required time and effort but it wasn’t hard. Early start to healthy eating habits is crucial. I had written a separate post on this topic. So parents with new-born / infants, please avoid taking the easy route. Make fresh, home cooked food for your baby. He / She deserves it.